One concept I discuss in my workshops is "information asymmetry." It refers to the information gap facing one or both parties in a transaction. Think about online dating profiles and how the information presented is rarely sufficient to make an informed decision -- the "tall, 30-something, athletic type" might turn out to be a frumpy, late middle-aged couch potato! Or how real estate ads tend to mask deficiencies -- a "fixer-upper!" Or what used car salesmen say, or don't say, to entice you to buy some perpetually disabled lemon. The internet fundamentally changed how consumers purchase new cars, since we now have ready access to manufacturer pricing information and can comparison shop for similar models and accessory packages across multiple sources. It has also impacted airfares, with transparency creating greater competition for airlines when potential travelers can make informed choices. Why are we surprised, then, to learn that tools and practices have emerged to aid buyers in the purchase of legal services? Corporate counsel and procurement managers have access to a broad range of tools and best practices to inform their outside counsel selection process. Law firms accustomed to promoting brand and pedigree as a proxy for quality now face informed buyers who can precisely define what quality means to them and then measure individual law firm providers against that standard. And not surprisingly, many lawyers have discovered that their rates, their approach to client and matter management, and yes, even the quality of their legal work product, are wanting. Ouch. 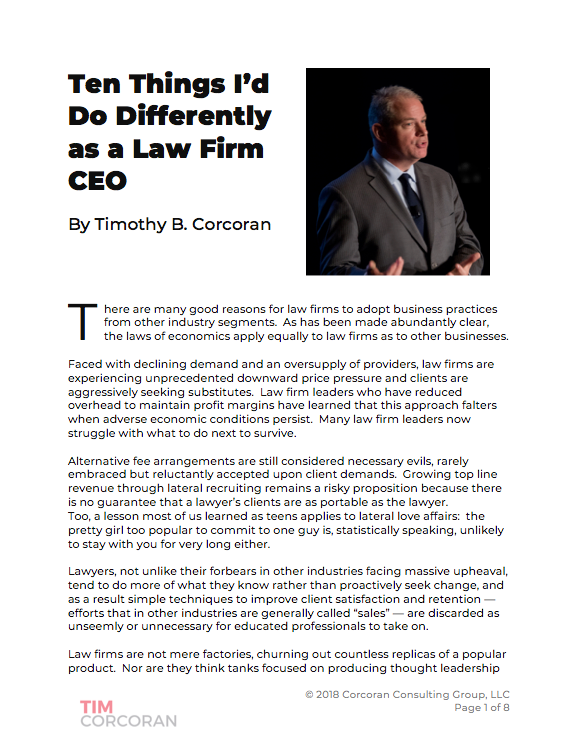 To be clear, I am not stating that lawyers are discovering that they're poor lawyers - but they may be learning that their clients define quality in different ways, and lawyers must first know and secondly measure their own performance against these quality metrics. This is still an emerging field. While some tools have existed for years, many buyers -- in-house counsel and procurement alike -- are still finding their way. It's as common to find a selection process geared to lower law firm rates as it is to find one engineered to identify the optimal firm for a given engagement based on non-financial matters. It's as common to find a law firm embracing a flexible approach to alternative fees and project management as it is to find one merely offering discounts as the solution to all client concerns. So it's a learning process for all parties. So, how can I learn more, you say? I'm glad you asked! I will be presenting a webinar on this topic shortly, along with veteran sourcing consultant Susan O'Brien, produced by my business partner Integrated Management Services. We will discuss how law departments and law firms often face similar challenges, namely to demonstrate value to their stakeholders and clients. Comparing billing rates is a starting point but may not paint the whole picture. Successful relationships begin with both parties understanding how value is defined and then tracking and measuring the key performance indicators. And even then the in-house counsel and outside counsel may have different interpretations of the same results, so regular communication is critical. We'll discuss the challenges in identifying and tracking the right metrics, and we'll share real life experiences from contrasting viewpoints - law firms, law departments, and business units. The Flip Side of Dashboard Reports: How Clients Perceive What You Measure will be held on Tuesday, 10 September, at 1 PM ET. To register for the webinar, click here. Note that there is a fee to attend but if you include promo code ims2013, the fee is waived. I will also be presenting a keynote talk at the upcoming TyMetrix LegalView Forum at the Terranea Resort outside Los Angeles. In the talk I'll connect the dots between the seemingly opposing goals of client satisfaction, law firm profits and work product quality, and we'll demonstrate how alternative fees, project management and process improvement are good for law firms. There will also be sessions on negotiation skills and the role of data in the decision process. Then we will embark upon a collaborative exercise to demonstrate how in-house counsel, corporate procurement managers, and partners, marketers, finance and pricing managers from outside law firms can achieve mutually satisfactory outcomes in a negotiation. This session builds upon the earlier LegalView forums held in New York, Washington, DC, and Chicago. Each of these prior sessions resulted in a white paper, which I strongly encourage you to read (click here, and select each of the prior forums to download the white papers). Negotiation Strategies for Corporations and Law Firms will be held at Terranea Resort on Monday and Tuesday, 23-24 September. To register for the workshop, click here. We're all in this together. Through improved communication and collaboration we'll find that the interests of in-house counsel and outside counsel are more in alignment than might otherwise appear obvious. Law departments embracing an outside counsel selection and management process informed by data have everything to gain by inviting their trusted law firm partners into the tent. Law firms that are ahead of the curve gain a strategic advantage by helping their clients make better hiring decisions. Let's get going.